Billy Franklin “The Bull” Williams, 83, husband of Charlotte (formerly Barber), passed away Wednesday, December 26, 2018. He was born on September 22, 1935 in Georgetown, Kentucky, son of the late George Franklin and Willie Zachary (Sidney) Williams. He was a graduate of Ed Davis High school of Scott County. 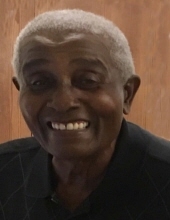 At an early age he professed his faith in Jesus Christ and joined New Zion United Methodist Church where he was a dedicated member and at one point in time he was a trustee. He was married to the former Charlotte Barber for 62 years. This union was blessed with three daughters. Billy had a generous loving spirit and was full of life. He was loved by many and his influence will forever remain in the lives of all who knew him. He quietly departed this life Wednesday, December 26, 2018 at Saint Joseph hospital in Lexington, Kentucky. Besides his parents, Billy was preceded in death by one sister, Cora Bell McNeal; three brother in laws, Leonard, Virgil, and William Barber; and one sister in law, Alutha McIntyre. Billy will forever be cherished in the lives of his children: Yolanda Price of Lexington, Kentucky, Lesley (Bill) Young of Lexington, Kentucky, and Kimberly (Eric) Mason of Georgetown, Kentucky, six grandchildren, Shawn Williams, Tiffany (Aaron) Mosley, Brandon (Khalilah) Young, Kiara Young, Erica Mason, and Lauren Mason; 10 great-grandchildren; one sister, Evelyn Williams of Lexington, Kentucky, two brothers, Sammy (Alice) Williams, Lexington, Kenneth (Sally) Williams of Austin, Texas; one brother-in-law, James (Emma) Barber and one sister-in-law, Jean Frazier; many “adoptive” children and a host of devoted nieces, nephews, cousins and friends. To send flowers or a remembrance gift to the family of Billy Franklin Williams, please visit our Tribute Store. "Email Address" would like to share the life celebration of Billy Franklin Williams. Click on the "link" to go to share a favorite memory or leave a condolence message for the family.